Food & Wine How did the humble chicken thigh conquer the boneless, skinless breast? White or dark meat? It’s a question most often posed at the Thanksgiving table. Since the convenience of packaged parts has rendered it unnecessary for us to know how to break down and debone whole birds, generations of Canadian home cooks have been loyal to the skinless, boneless chicken breast, a stalwart dinnertime staple perhaps only rivalled by the pound of ground (beef). Mild and plump, skinless, boneless chicken breasts were prized for their versatility but mostly for their leanness, which was considered a virtue primarily in the North American market, an ideal amplified by a fast- and convenience-focused food industry that promoted “all white meat” sandwiches and nuggets. 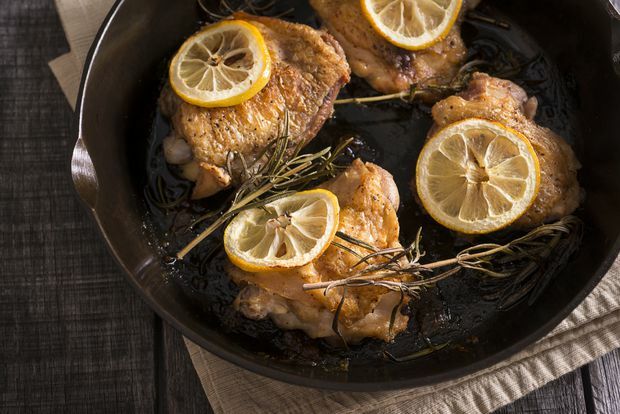 Smaller, darker chicken thighs have long been the cheaper grocery store alternative, but as we lose our collective fear of fat and realize what the rest of the world already understands without question – chicken thighs are delicious – the dinner tables have turned. Thighs are finally getting a leg up; whether they’re sold with or without skin and bone, they’re now often pricier than breasts at butcher shops and grocery stores across the country. “Everything works on supply and demand,” says John Wildenborg, owner of Master Meats Butcher Shop in Calgary. In Canada, the poultry industry’s supply-management system guarantees a fixed price for producers of live birds, determined every eight weeks and calculated based on the state of the industry in Ontario, the province that produces the most chickens. Beyond the farm, wholesale and retail prices are then determined by market conditions and consumer preferences. Over the years, Wildenborg theorizes, home cooks have viewed thighs as a cheaper cut – a means of stretching their food dollars – and by falling into the habit of buying them, got used to cooking with them. “I’d take chicken thighs over breasts any day of the week,” he says. “When we slightly overcook chicken breast, it’s not nice. You have a little more wiggle room with a chicken thigh. Even when it’s overcooked, it’s still tender and juicy.” Now that we’ve moved past our fat phobia, the slightly higher fat content of a thigh, even one with skin, is no longer considered a downside, but a bonus. Most cuts of meat taste better when they’ve been cooked on the bone, and a bone-in thigh is easier to handle than a bone-in breast. The shape and size of thighs also allows them to cook more quickly and evenly, with less risk of drying out. Wildenborg reminisces about a time in the eighties when no one was buying chicken wings. It wasn’t until bars and restaurants started putting them on appetizer menus that chicken wings became popular enough for farmers to sell. Today, drumsticks are the pieces they struggle to get rid of, but the thigh is no longer considered surplus. Perhaps a balance in demand on the consumer side will slowly drive chickens back to the proportions of generations past; a 2014 study published in the Journal of Poultry Science showed that modern-day chickens are about four times the size they were in the fifties, with decades of breeding in response to consumer preferences driving up the breast size 80 per cent.